Everyday Use by Alice Walker essays examine Walker's story, told in the first-person by “Mama,” that explores the African-American experience in the South. 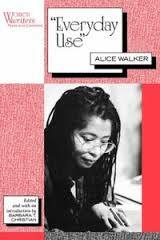 Alice Walker’s short story “Everyday Use,” first published in her 1973 collection In Love and Trouble, is widely considered to be one of her best. Told in the first-person by “Mama,” the story explores the African-American experience in the South, connecting past and present through the symbol of a quilt. The emergence of a new identity following the Civil Rights Movement is contrasted with the conflicts that occur within a family. Mama (Mrs. Johnson) is the narrator of the story, and lives with her younger daughter Maggie, who is described as both dull and unattractive. The events of the story unfold when the older sister, Dee, returns from school. Dee is representative of the more militant Black Power Movement of the late 1960s/early 1970s, calling herself “Wangero.” When Dee returns home, she wants several antique family heirlooms, including a butter churn carved by her uncle and a quilt, made from her great-grandfather’s Civil War uniform. Dee, however, wants these articles for reasons that are not connected to history. She wants the butter churn, for instance, merely as a decoration. She claims that she wants the quilt as connection to her family, but her rejection of her name “Dee,” which is a family name throughout generations, indicates that she does not understand her own family’s history. Eventually, Mama decides to give the quilt to Maggie, and sit and watch Dee and her boyfriend drive off. Paper Masters writes custom research papers on Everyday Use by Alice Walker and examine Walker's story, told in the first-person by “Mama,” that explores the African-American experience in the South.